Considering a new iPhone 8 or 8 Plus? 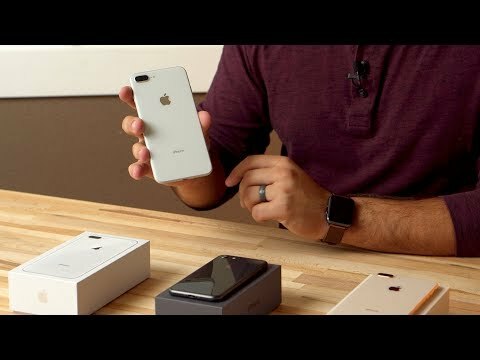 AppleInsider unboxes all three color options of Apple's latest handset lineup and goes through the new Quick Start setup feature, which lets users transfer setup options and settings over from another device running iOS 11. Oh, oh, should I wait for the X or go with the 8+? I live the gold. No gold with the X. Is it worth it? It’s hard when you are an early adopter. No lines at my nearby Apple Store today. Either everyone's waiting for the iPhone X or far fewer people are upgrading to the newer models. I'm torn between the 8+ and the X. I have used big phones for 3 years and prefer the size. But the X is an awesome device! The 8+ might win for the size as its no device to sneeze at. As far as the back colour I only look at the front of it anyway and have a slim case on so I choose it for the colour of the bezels. In my case I prefer black. Not a logical conclusion. As has been reported all day, every day now, Apple store lines have been decreasing over the last few years because of online ordering. I am torn between the cream gold and the space gray 8! Do any men like it too or is it just me? LOL! I have absolutely no confusion at all. I will go for the iPhone X when it releases and then pick up the iPhone 8/ 8 Plus sometime next year to round off my collection!